This post is written in collaboration with BoConcept Manchester. Massive GIVEAWAY alert - read on for more details! Our living room just got a little bit more stylish with the recent arrival of an elegant pink lady. 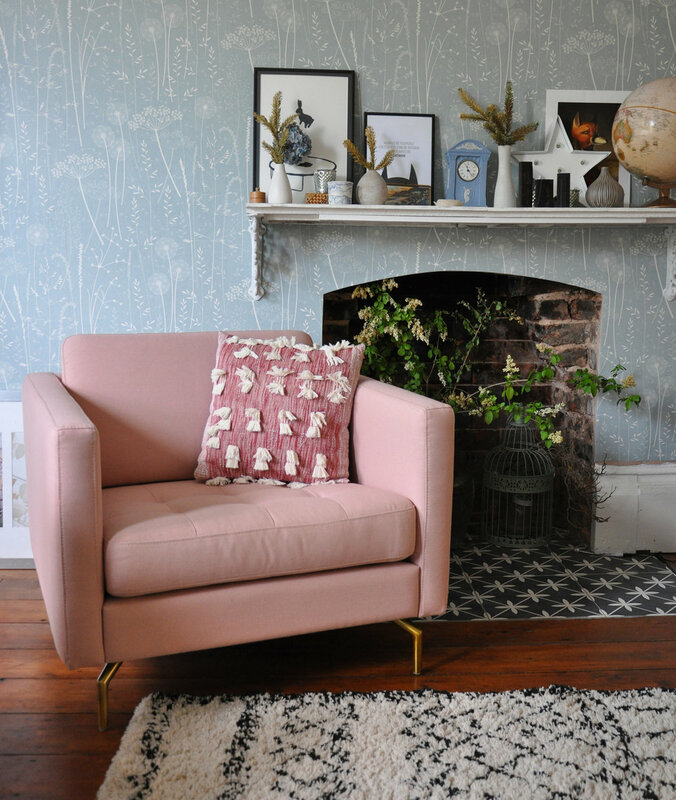 She's the Osaka chair from BoConcept Manchester, upholstered in pink Leeds fabric (which is tough enough to withstand six small daughter feet and twelve small furry paws) with brushed brass feet and a tufted seat. Doesn't she look beautiful sitting pretty next to our 145 year old Victorian fireplace? Designed by Anders Nørgaard, the Osaka armchair references both femininity and 60s design. The chair has a light design and slim proportions, which help it to slip perfectly into our home as a more structured, contemporary counterpart to our existing slouchy linen corner sofa and traditional velvet love seat. The beautiful tufted seat adds visual softness, while the classic, straight armrests emphasise the clean lines and Scandinavian look. Slim aluminium legs (brushed brass in our case, but there are other equally lovely finishes available) complete the light look. So, would you like to WIN a stunning Osaka chair of your own, worth over £650? Well, you can! That's right, I'm absolutely thrilled to be GIVING AWAY one of these stunning armchairs, upholstered in any group one fabric, courtesy of BoConcept Manchester. If you wish to enter, please follow this link and fill in your details by Thursday 19 July. By agreeing to do this, you give BoConcept Manchester permission to add you to their newsletter database. As you will see on the entry form, you can opt out at any time by unsubscribing or notifying BoConcept Manchester by email. The competition is open to UK entrants only, and BoConcept Manchester will pick the winner, who will also be invited to visit the Manchester store for a free design consultation. Fabric upgrade and footstool are available at additional cost to the winner. For TEN additional entries, please visit my Instagram page and regram the picture of the chair on your feed or Stories, tagging @simplythenest and @boconcept_manchester. This is a HUGE giveaway for me, and I'm so happy to be able to give something so beautiful to one of you lovely readers of Simply The Nest. I've photographed the Osaka armchair in our living room, but she's currently residing in our open plan dining area - and may at some stage make her way upstairs to our master bedroom. I love rearranging the furniture and like to choose chameleon 'hero' pieces that look fabulous in different settings. Here are a few moodboards of the Osaka armchair, showing how you could style it in three different rooms with various wallpapers and BoConcept Manchester products. Osaka armchair, Hannah Nunn 'Paper Meadow' wallpaper in teal, Bornholm side table, Hexagon lantern, Kip standard lamp. Osaka armchair, Ellis Cashman 'Dark Floral' wallpaper, Milano dining table, Ottawa chair, Five ceiling pendant, Nora teapot. Osaka armchair, Farrow & Ball 'Lotus' wallpaper, Stroc rug, Lugano bed, Valencia side table, Fringes cushion, Tear plant hanger. What are you waiting for? Go and enter the competition now to WIN this beautiful chair for yourself! Good luck! 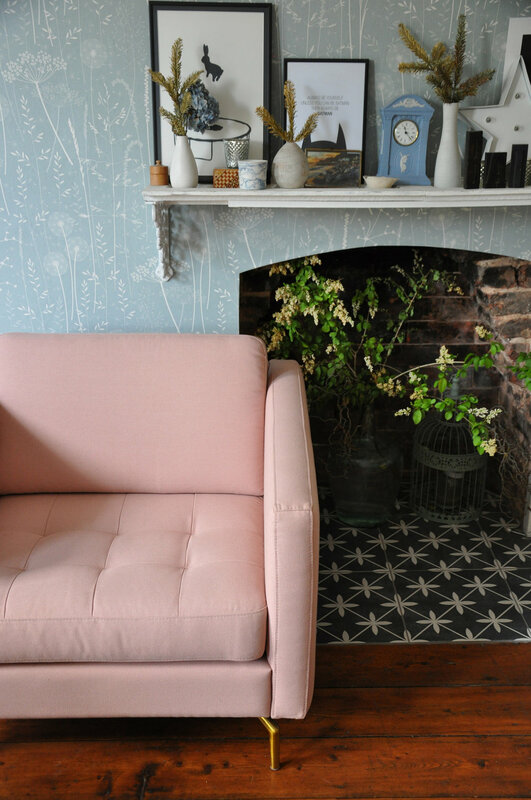 This post is written in collaboration with BoConcept Manchester, who kindly gifted me the Osaka armchair.